Just like its predecessor, the DP212, to comply with GT regulations, the DP214 was based on DB4GT chassis, numbers #0194/R and #0195/R. The body was completely redesigned, using elements from the DP212 such as the Kamm tail rear end. The bodywork would be wider than the DP212 though, and the nose would be a completely new design. The DP214 would also use a production Tadek Marek 3.7 litre Inline-6, (bored to 3750 cc from 3670 cc) unlike the DP212's larger 4.0 litre engine. Unlike the DP212, the DP214s would be used in races other than Le Mans. The DP214 would make its debut with DP215 at the 1963 24 Hours of Le Mans, Bill Kimberley and Jo Schlesser in 0194 and Bruce McLaren and Innes Ireland in 0195. During practice recording, DP214 set an unofficial time of 3m 58.7s and an official time of 4m 00s, with Ireland recording 300 kilometres per hour (186.4 mph) down the Mulsanne straight. The race plan was for 0194 and 0195 to lap at 4m 15s. On lap 28 McLaren in 0195 pitted when leading the GT class and 10th overall. 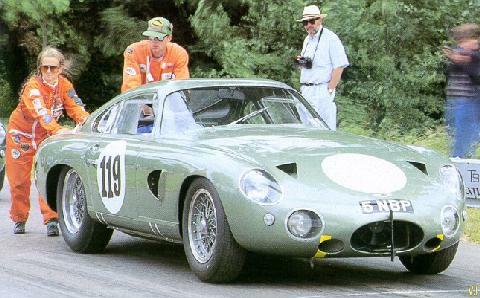 Ireland took over 0195 and took it up to 6th overall but during his stint a piston failed down the Mulsanne straight on lap 60 (4h 06m) and forced them to retire, which was a result similar to that of DP212 in 1962. Moving to the Guard's Trophy at Brands Hatch, a lone DP214, driven by Innes Ireland would manage to finish in sixth place overall, and second in class. With the second DP214 (0195) retiring, after spinning off (Kimberley). This was followed by a seventh place finish and fourth in class in the TT at Goodwood Circuit for 0194, with 0195, driven by McLaren retiring after 95 laps with a valve failure. The two cars were certainly capable of winning the TT at Goodwood in the hands of Innes Ireland and Bruce Mclaren, but unfortunately they fell foul of the RAC Scrutineer (Procter). He refused to allow the cars to run with the 6.5" inch rims that they had run at Le Mans, because they had not been homologated, even though by then the production cars were fitted with them as standard. As it was, they were required to race with 5.5" inch rims, which actually narrowed the track by 4" inches and ruined their handling. They had never run with these narrow rims in the first place, and were never to do so again. An angry Innes Ireland spent the whole race going luridly sideways in the car which he had originally put on pole. Unfortunately, one of the DP214s (0195) was destroyed in an accident during practice at the Nürburgring 1000 km in 1964, killing driver Brian Hetreed. Hetreed crashe on his first practice lap, with the car rolling down a bank at 'Bergwerk' corner. The other lone DP214 finished out the season, moving onto Le Mans again. With Peter Sutcliffe and Michael Salmon racing at the 1964 24 Hours of Le Mans. At the end of the first lap DP214 was running in tenth place, dropping to eleventh after half an hour. Early evening pit stops had moved the car up to sixth overall, but again dropped, down to twelfth place. However after 17h 45m on Sunday morning they were disqualified due to replenishing the car's oil at the wrong time when lying 11th. The remains of 0195 were returned to London from Germany and were comprehensively cut up and destroyed. With the engine being repaired and going into an Aston Martin DB4GT Zagato, with chassis number DB4GT/0200/R. In 1965 the sole remaining DP214 was bought by Tom Rose, who painted the car, a very dark blue, possibly black in colour. Rose registered the car with the registration number '5 NBP' (which it still holds today) and then competed the car in Aston Martin events during the next year. Results including a win at Wiscombe Park and at the Belgian Day of Records (Jabbeke Speed Trial) Rose set a best time, with a top speed of 163.5 mph (263.1 km/h). Finally driven by Pye, the car competed at B.A.R.C. Goodwood event, were Pye set a best time. In 1967 at the Belgian day of Records, Crabbe won again, this time finishing first in class. The final event with Colin Crabbe owning the car, was with Neil Corner in the 'Emu Trohpy' at Aston Martin Owners Club (AMOC) Silverstone event. After the last race under ownership of Colin Crabbe, Mike Ottway acquired the car with an 3,750 cc engine installed and a damaged DP215 engine as a spare. After this Nick Cussons raced the car regularly, but it is unclear whether Cussons owned the car during this time. In 1973 Cussons won first in class at Curborough, and was again first in class at the Jaguar Drivers' Club (JDC). Cussons was also first overall in the B.R.S.C.C. at Snetterton, also in 1973. In its last outing of the era, Cussons was third in class at B.A.R.C at Thruxton in 1974. During this period Nick Cussons also raced the car in his own Cussons Post-Historic Championship. During the period of 1974/5 to 1992 the project car has gone under a full, 'pains-taking' restoration by Mike Ottway. The car was then acquired by Simon Draper. Presumably this is when the car was returned to its original colour, which it still has today.